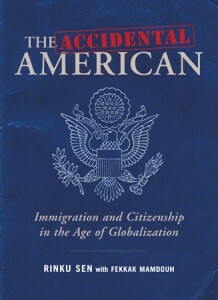 This month, Rinku Sen launches a new book, "The Accidental American: Immigration and Citizenship in the Age of Globalization." In the book, Sen, along with Fekkak Mamdouh, narrates the story of the Restaurant Opportunities Center of New York, an organization that supports and organizes workers in New York’s restaurant industry. ROC-NY was initially founded by Mamdouh and fellow organizer Saru Jayaraman to support workers, like Mamdouh himself, who were displaced from their jobs at Windows on the World, the restaurant that was at the top of the World Trade Center’s North Tower. In the aftermath of the 2001 terrorist attack, which claimed the lives of 72 individuals who worked at Windows, ROC-NY helped the surviving Windows workers launch a cooperatively-owned restaurant, Colors. Since then, the organization has expanded its work to organize and advocate for improved working conditions for restaurant workers throughout New York City, and has explored the prospects for expanding its work nationally.